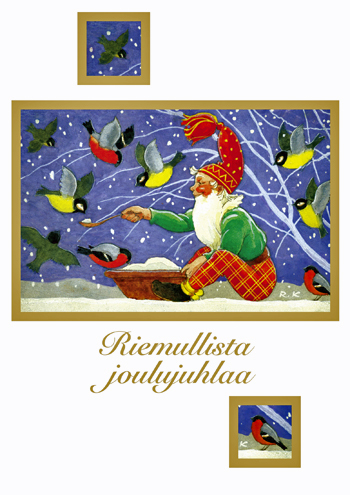 The two-folded gift card (190mm X 135 mm closed) contains an audio CD, Christmas greetings in Finnish ("Hyvää joulua ja onnellista uutta vuotta!") and space for your own text on the inside pages, as well as a detailed track listing on the back cover. The full colour card features famous illustrations by Finnish painter Rudolf Koivu (1890-1946). The audio CD couples four popular Christmas songs, performed by outstanding Finnish performers such as soprano Karita Mattila (1), mezzo-soprano Lilli Paasikivi (3), tenor Raimo Sirkiä (4) and the YL Male Voice Choir (2), to produce a unique Christmas listening experience.